Yates is transitioning to a new online giving provider called Pushpay. This giving portal will be simple to use and is available now. Click here to get started with Pushpay. There is a text giving option as well. 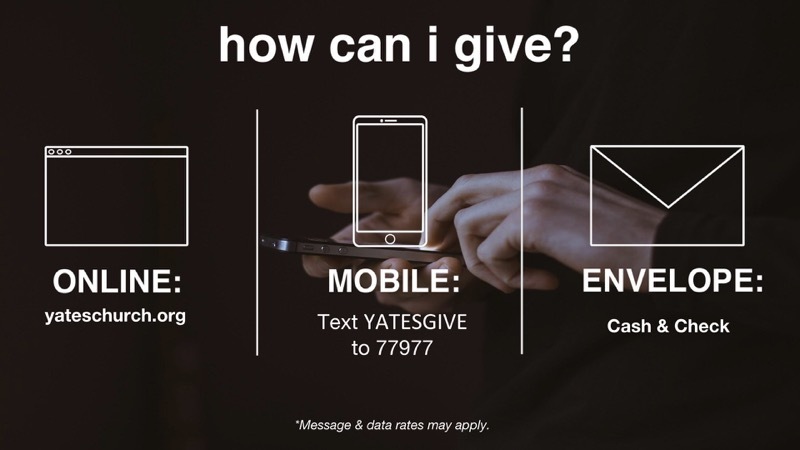 Simply text YATESGIVE to 77977 and enter the mobile giving platform. You can still give by way of cash or check, with or without an envelope. The Vanco Giving Portal is still available for a limited time. If you have given online through Vanco, you can still do so here. Please transition your online giving to the Pushpay platform before May 20, 2019. If you have any questions, please contact the church office at 919-489-2309.